This technique has been around for a LONG time; it's very clever, easy and the result looks so wonderful. In my not-so-humble opinion, it's visually much nicer than butted borders. One problem with having a video tutorial, as great as it is having live-action demonstrations available, when it comes to making something, I like to have *physical* directions in front of me, something that I can jot down notes to myself. As I was making the first blanket, I was also writing down the steps involved. I did think that I would write them up into a tutorial for not only myself but others. I should have realized that OTHER people might have already created printable directions for the self-mitering receiving blankets, seeing as the concept has been around for a while! When I was looking around to find the "earliest" reference I found at least two printable versions that are more than adequate. 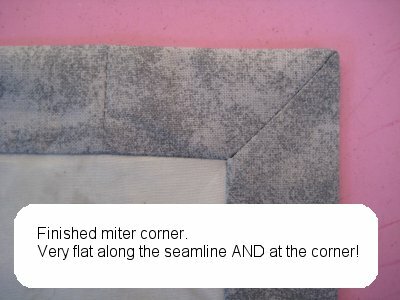 The Mitered Corner Blanket is a PDF dated March 2007 from the Utah State University Cooperative Extension and is anally-retentive (said in the most constructive way possible). It has more information than you might want to be aware of and certainly more than I ever realized. :-) Some of their drawings could be a little larger (specifically the part about making the miter), but this PDF is excellent. The Self Binding Receiving Blanket by Natalia Bonner of Piece N Quilt is a printable document on Google Docs. It's more of a literal translation of the Missouri Star Quilting Company's YouTube video BUT she does have an excellent shortcut for a foolproof way to figuring out where that all-important miter sewing line should be. 1. I *pressed* the miter seam allowance open. This distributes the bulk evenly and allows a VERY flat corner. 2. 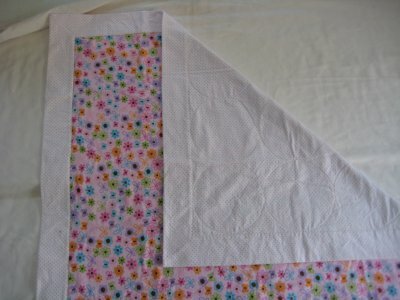 I also pressed the seam allowances of the border/interior towards the border. a. 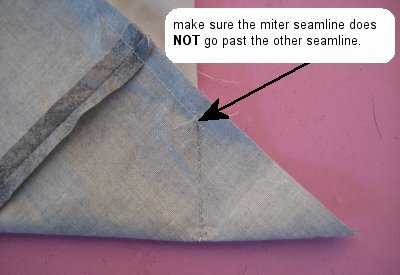 First, you absolutely, positively must MAKE SURE that the two seamlines (the interior/border seamline and the miter seamline) do NOT NOT NOT go past each other. It's better to have a small gap where the intersection is than to have the stitchings go past each other. b. 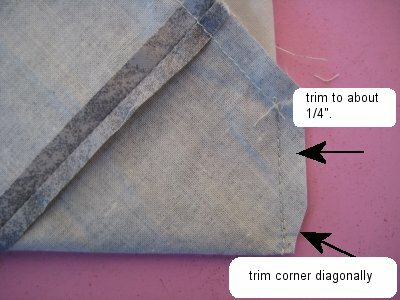 Trim away the excess fabric in the corner. It doesn't need to be exactly 1/4"; just eyeball it. No one is going to get inside with a ruler to judge you. 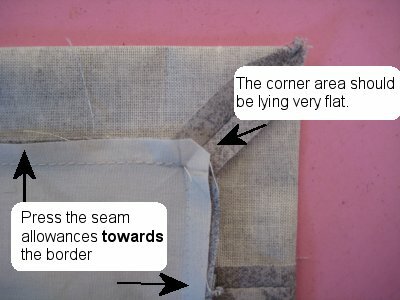 I also diagonally trim the corner away in order to reduce the bulk in that area when the item is turned right side out. Be careful not to trim too closely to the stitched line. c. Press the miter seam allowance open. 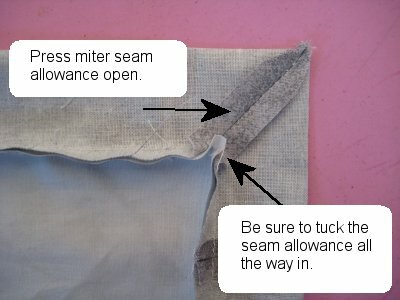 If you do this, you won't have a lump on one side of the seam line when you turn the blanket right side out. Also, I like to make sure that the miter seam allowance is tucked *all the way* next to the adjacent seamline. This also helps with creating a very flat mitered corner area. d. Now, press the rest of the seam allowances towards the borders. The corner of the miter should lie very flat. 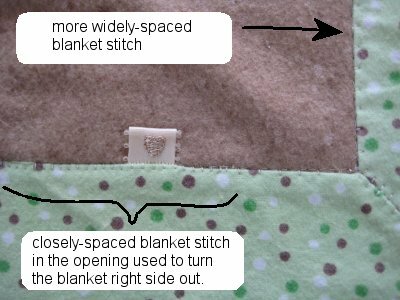 I found that if I didn't press the seam allowances "up", when I turned the blanket right side out, they would sometimes "flip" on me. It was then quite annoying to try to get the seam allowances where they should be. 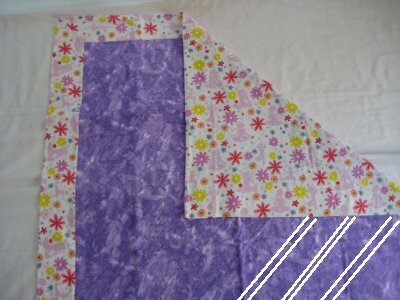 e. When you finally turn the blanket right side out and give the borders a final pressing, you'll find that you have a VERY flat miter. With the seamlines pressed towards the borders, it creates a very nice area for the top-stitching, which holds the seam allowances down and stabilizes the entire blanket. THEN I turned the blanket right side out. 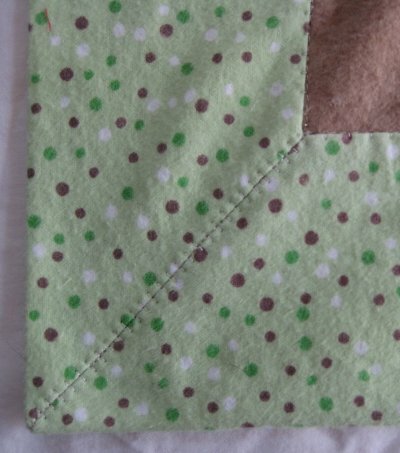 I think the video has you turn the blanket then press the seam allowance towards the border from the right side. BUT, I found that if I did the extra step of pressing the seam allowance up before turning, the seam allowance didn't fight me. And then about that final, decorative top-stitching .... you do it to hold the seam allowances in place through all the laundering the blanket is going to get. Missouri Star Quilting Company (and others) advocate a simple top-stitching, about 1/8" away from the seam allowance. 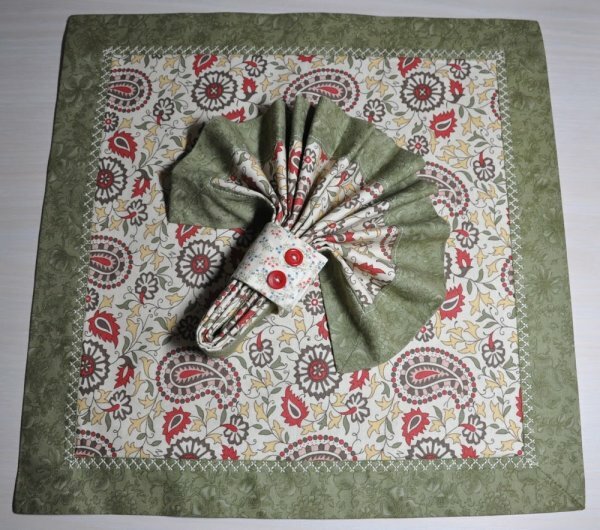 I did this but didn't like it so much because the area where you turned the quilt (obviously) is not stitched down. If you do just a top-stitch, that gap area is actually a small "flap" since it's not stitched down in a seam like the rest of the seam. Instead, I chose to use a blanket stitch/buttonhole decorative stitch. 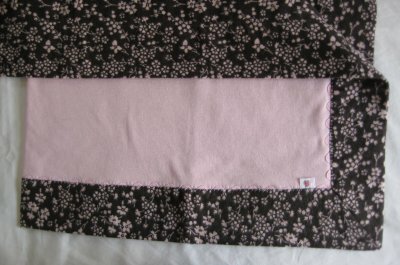 But I do use 3 of them for the decorative top-stitching for these blankets. First, I use Mode 2, stitch 34. This is a closely spaced blanket stitch. I use this in the area where I turned the quilt so that the unstitched seamline area is firmly held in place. 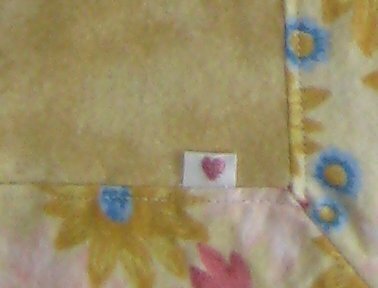 This gap area is also where I put my little 'tags' .. they are just for pretty ... and the close blanket stitch secures the tag nicely. Once the gap area is stitched, I switch to stitch 36 (still in Mode 2). This is a wider-spaced blanket stitch. The straight stitching is like a stitch in the ditch and the little perpendicular stitches go into the border area to hold the seam allowance down. The jury is still out as to whether I'm going to continue to use the third decorative stitch. This is Mode 2, stitch 64 and looks like a straight line with small cross-bars. I used it specifically on the miter seamline so that the cross-bars would hold the miter seam allowances down. I'm not entirely sure if laundering would cause the miter seam allowances to bunch up, but if they do, I'm hoping that this stitch will tend to hold them in place. The decorative stitches take a little longer to stitch out, but they look nice. I've seen where some people use a zig-zag stitch, but I just don't care for that look. 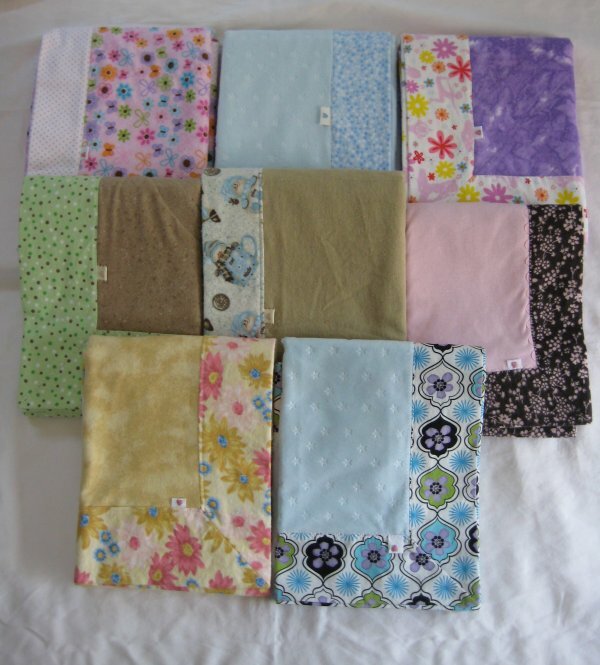 So, don't feel constrained to make the blankets with *just* cotton or *just* flannel; mixtures are OK, too. Everything was washed before I used it, so there won't be any surprise shrinkage later on. I am concerned that, upon many subsequent launderings, the center of the blanket is going to become mis-aligned or get "bubbly". 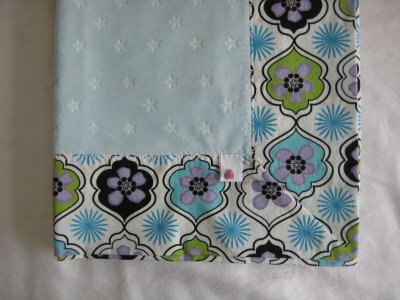 I didn't want to spend a lot of time quilting the interior but did want to somehow attach the interior front and back. So, I wanted some limited quilting ... but as I got into it, it turned out to be some not-so-minimal quilting! Doing more quilting did take more time, which is exactly what I didn't want to do. On the other hand, I know the blankets will hold together nicely. They really are a lot of fun to make. AND THEN .... just so you don't think you are limited to making only baby blankets with this technique, in 2009, Moda came up with a project that used this method to create high-end napkins for your table. Now, granted, the main emphasis of this project was making Dresden Plate chargers for your plates but included in the project were instructions to make the napkins also! 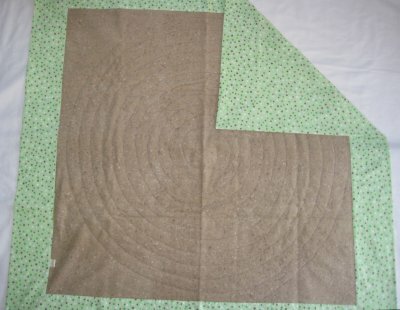 You use 2 Fat Quarters (one is cut down to 12"x12") to make one napkin. But the technique is EXACTLY the same as for these blankets. Do look at the *lovely* decorative stitch they used to hold the seam allowances down!